Upsiide is a new idea screening app that is inspired by Tinder. Designed by Dig Insights (the experts behind the NCA’s National Coffee Drinking Trends Report and new Generational Report), the mobile platform connects companies to real-time consumer feedback and powerful analytics. Consumers using the app will be shown an idea (a new beverage idea, a potential claim, a packaging idea, a branding idea a positioning idea, etc.). The idea can be expressed with any combination of text / images / video. The consumer can either like or dislike the idea (by swiping), or request more information. Once two ideas are liked, they are paired head-to-head and the consumer tells us which is best. The winner moves on to the next round. So what does Upsiide tell us about beverages? Note that Upsiide is a read of appeal. While these numbers should relate to the relative penetration of each beverage in-market, consumption frequency also plays a huge role in volumes, as does marketing, distribution, promotion, etc. The appeal of iced coffee is reflective of the timing of this study; it was fielded in the late summer. Appeal for some coffee beverages skews younger: iced coffee, frozen blended coffee, cold brew, caffè americano, nitro and flat white all see stronger appeal among younger consumers. Cappuccino and espresso appeal is strongest among 35-54 year old consumers. Traditional coffee appeal is also strongest among this age cohort and consumers aged 55+. 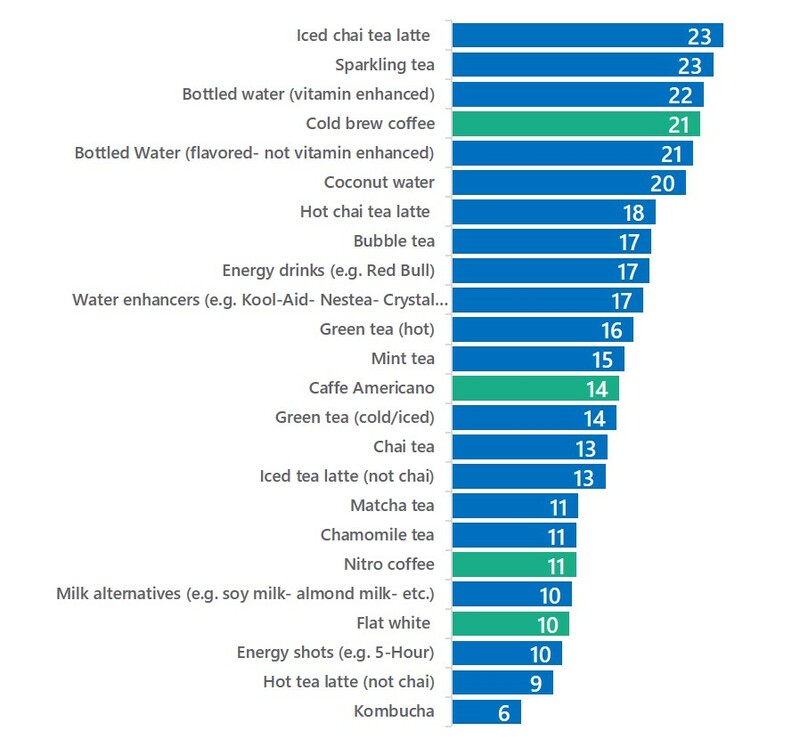 Several beverages are more popular among women: iced coffee, café mocha, frozen blended coffee, cafe con leche and cold brew coffee all perform better among women than men. In contrast, traditional hot coffee, espresso and caffè americano perform better among men than women. Café mocha, latte, espresso, caffè americano, and flat white are all more popular in the Midwest than other regions. 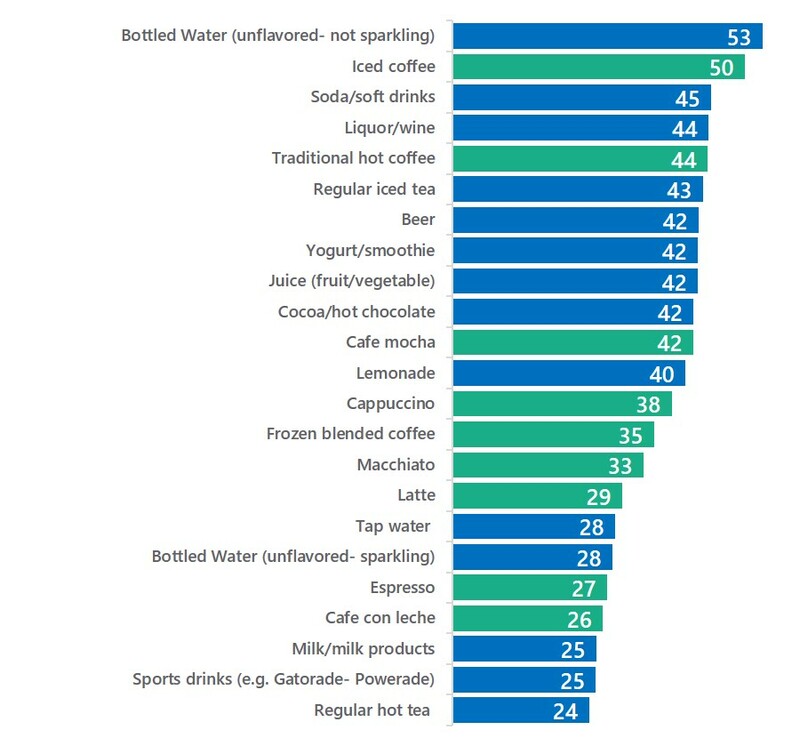 Consumers in the Northeast and West are more likely to find iced coffee appealing. Consumers in the West are more likely to be fans of frozen blended coffee. Upsiide offers companies a fast, cost-effective way to target consumers and get customized market insights. NCA members are eligible for a 10% discount on their own customized Upsiide idea screening. For more information, visit their website or contact Michael Edwards at michael@diginsights.com. Learn more about NCA coffee market research.